He’s playing one on TV this fall in a new ABC crime series, but Nathan Fillion is no "rookie." In fact, the actor will celebrate his 25th (!) anniversary in show business next year. How do we know this? He hasn’t deleted his first credit — a three-year stint as Joey Buchanan on the now defunct ABC soap One Life to Live — from his official bio. 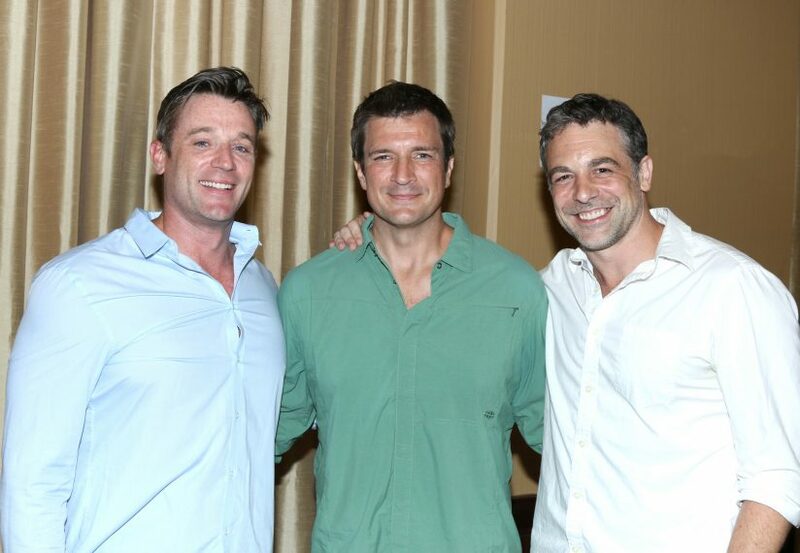 TV Insider caught up with Fillion at the ABC TCA summer press party to chat about playing a 40-year-old newbie police officer on The Rookie, his daytime past, and more. Read on to get the scoop from the affable actor! Nathan Fillion, Grace Park, Leighton Meester, and more. Your character on The Rookie, John Nolan, decides to join the Los Angeles Police Department after his personal life falls apart and he survives an attempted bank robbery. Nathan Fillion: Yes. John Nolan loses his goal in life. He’s not required as a dad and he’s no longer a husband. He no longer has a family. He is looking for a way to matter. In the bank robbery, he is faced with a moment where he can do nothing or actually try to help in the face of something terribly dangerous. When something has gotten out of hand, that’s when you call the police. That’s when their job starts and your job ends. John’s inspired to do something that matters. He discovers a calling. Can you relate to him? Good question. I am so fortunate in that the job I’ve chosen to do I am still managing to be relevant and gainfully employed. I haven’t had to do the flip yet [that John has]. I’m still riding a fantastic wave. Fingers crossed, I hope it lasts. What’s it like to start over with a new series? I don’t know how much it is ‘starting over’ as much as it is ‘keep going.’ I’m so fortunate in this industry to have a job. You hope you work and you hope it’s great. When people enjoy it, even better. When you are regarded as a success, you’ve made it. If you can continue to work after that and remain somewhat relevant? My secret is riding on coattails. What did you think of the end of Castle? It looked like Castle and Beckett (Stana Katic) were going to die these horrible deaths, but then they got a happily ever after. I’m totally happy and satisfied [with the ending]. I was telling stories more than watching them. My lens is far different. I’m far less an audience member than a participant. Had you thought about doing a comedy after Castle? I thought about a lot of things. It’s not like saying, ‘I’m ready to do a half-hour comedy [so] I’ll pick up the phone and do it.’ Jobs comes when they come. I recognize an excellent opportunity and this, The Rookie, is one I couldn’t say no to. You’re known and loved for Castle, Firefly, Dr. Horrible’s Sing-Along Blog, One Life to Live, and other series. Do you find your fan bases cross over? Your appearance at a recent All My Children/One Life to Live fan event last month was a pleasant surprise. How was it for you? Fantastic. I hadn’t seen Erin Torpey — who played my sister Jessica — in ages. I hadn’t seen Kirk Geiger — who played my brother Kevin — in 20 years. I’m still friends with a lot of those people. Kassie [DePaiva, ex-Blair] was the one who told me about the event. What was your experience in daytime like? I’ll never speak poorly about daytime drama. The people on that show took me in and took care of me. There is no one there I wouldn’t give a giant hug to. If you’re going to learn the ropes, learn them from the best. I was there working with people who’d been in the business 15, 25, 35 years. You can’t argue that kind of experience. They’ve either seen it, done it, or heard about it. How did your parents feel about you moving to New York at such a young age? They were terrified for me. When my parents came to visit me, Erika Slezak — who played my mother, Viki [on One Life to Live] — sat down and talked to them. As they left the studio, my parents were calm and relaxed. They said, ‘OK, these are good people and they actually care about you. This is going to be a great job for you.’ I was in an incredibly safe place where I could learn at an incredibly intense rate. I was bumping elbows with the best. 'American Housewife,' 'Modern Family,' and more make the list. Who from One Life to Live would you like to work with again? All of them — Gina Tognoni (ex-Kelly), Susan Haskell [ex-Marty], Thorsten Kaye [ex-Patrick], Bob Krimmer [ex-Andrew], Bob Woods [ex-Bo]... I could go on. I want Bob Woods to be on The Rookie. You posing for a photo with the other "Joeys" — Tom Degnan, Chris McKenna — solved the age old question: Who’s taller, you or Chris? You played a version of yourself on American Housewife; at least one character didn’t believe you were “you.” Has that ever happened in real-life? Yes. People often say to me, ‘You sound like Nathan Fillion, but you don’t look like him.’ People are shocked that I’m tall. People ask me if anybody has ever told me I look like Nathan Fillion. Then, again, I’m often mistaken for Jason Bateman.